VEGAS, BABY, my home away from home. Well, for the week at least. WHAT: The biggest party in the world of Romance Writing. Agents, authors, publishers, bloggers, and more importantly: READERS all converge in a week long fest of good times. ME: I’ll be signing books, attending events, drinking cocktails, and (most definitely) hitting the craps tables at some point, and I would love nothing more than to see YOU. Book signings: Wednesday, 3:15pm (I’m with Tessa Dare, ahh!) in room AMAZON G. I’ll also be at the Giant Book Fair on Saturday signing (I’m next to Damon Suede!) in the RIO PAVILION, and this starts at 10:30am and goes until 2:30pm on Saturday. There are so many great sessions this week, so the best way to find me (and please do!) is via my Twitter. I would love, love, love to meet you guys, talk about the things we love and have the best time ever. Last year was a blast, and this year promises to be even better. And guys? Guys? I’m such a good luck charm at the table. No, really. You’re so money and you don’t even know it, baby. Let’s do this! It’s time! Release Day! To go along with Bitter Springs hitting bookshelves around the globe, I’ll be traveling along this series of tubes and cat memes we call the “inter-net” at various book blogs to talk about the book, the proper way to make nachos, why Haas avocados are essential for the very best guacamole, and why dudes on horseback are basically the best dudes. THIS IS GREAT FOR YOU, AND I’LL TELL YOU WHY: every blog stop on my tour means a chance for you to laugh (I seriously try to make it as fun and entertaining as possible) and every comment left at every stop is automatically entered to win a copy of my book! Multiple stops every day. MULTIPLE CHANCES TO WIN. EVERY DAY. ALL DAY ERR-DAY. Okay, until the 16th, when my stops end, but YOU can keep on entering if you missed a stop until the 23rd of December. PRETTY COOL. It’s Raining Men – chance to enter and win! 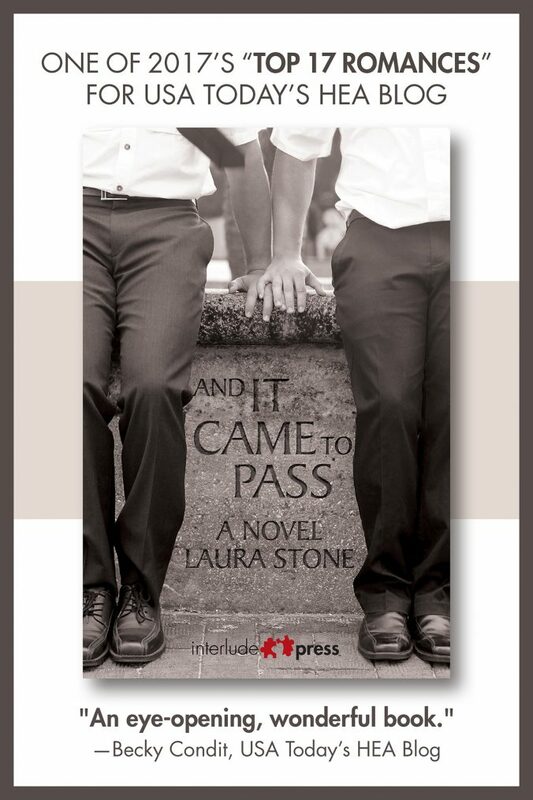 Hearts on Fire – chance to enter and win! Divine Magazine – chance to enter and win! Not officially on my tour, but Jude Sierra shared such a lovely review, and I was so touched that I’m linking it here. When a wonderful writer pays you a compliment, it’s just freaking awesome. Love Bytes wants to know what my Last Day On Earth Meal is as well as a talk about what makes a hero (Chris Evans), Renaldo Valle Santos (as played by Chris Evans). 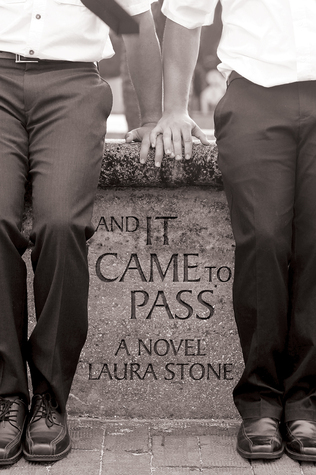 Laura, there is no Chris Evans in this book. Can we just focus? Please? CheekyPee BooksandReviews where I’m interviewed after the blurb, and it contains nuggets like who I love to write with and some word association. BFD Books and Reviews, which I assumed meant “Big F*cking Deal” because they have the best banner and lots of awesome books, but apparently stands for Books, Friends and Drinks, which happen to be three things I love more than anything else. Yeah, they went with the right one there. And last but certainly not least, the Mack Daddy of book blogs, Prism Book Alliance, and here I got to relive the glory days of the @okaybutlistenpodcast and talk about the TV show I’d love to bring back and why. You have 20 chances to enter to win, so stop at each place and get your entry in! 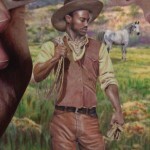 …overwhelming me with pride (ha) and happiness! The American Library Association gives Bitter Springs a thumbs up (oh my gosh, libraries are so important to me). Publisher’s Weekly also has a positive review. My favorite bit, though, is “a scene of Renaldo teaching Hank Spanish endearments is particularly delightful.” Â Y’all, I’m not going to lie to you. Some of that Spanish is straight up dirty talk. And you should add that to your vocabulary STAT. Haha. 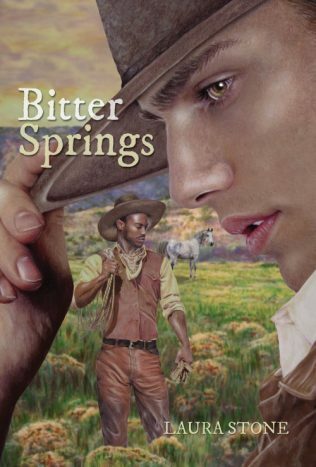 Bitter Springs is available for pre-orders at Amazon, B&N, and the IP Store, preorders at my publisher’s store will also get you a free eBook. ItÂ will be out on December 3, 2015. I had a fantastically productive meeting with my editor/publisher today. Â My story about two LDS missionaries who discover their feelings for one another while serving, a story that has languished on my computer forÂ years and went through a few rounds in my writing group back in 2009 [yeesh, I’m getting old! ], is moving along at a faster clip to get published. Â I’ll have some ARCs/Galleys for April’s RTConvention in Vegas, 2016, and we should be set to get it widely available come Summer, 2016. I love this story so much, and can’t wait to share it. IÂ also got the green light forÂ a FREE story, a sort of spin-off about one character in BITTER SPRINGS. Â I’ve been really worried about this one for a multitude of reasons. Â It’s about Two Spirits, it’s about Mescalero Apaches, and I’m a white woman. I have to be 1000% certain to be respectful of other cultures here, because goodness knows Native Americans haven’t been treated with much respect, let alone Two Spirits. Â Understand that the term “Two Spirit” is the adopted modern term, as it wasn’t called that in the time that BITTER SPRINGS is set, but for modern talking with you purposes, that’s what I’m referring to. (If you’re interested, according to my Mescalero Apache resource, TsÃ¡-Cho, our protagonist, would have been referred to asÂ ndeâ€™isdzan. Â The Navajo (a sort of sister language) would have called himÂ nÃ¡dleehÃ©. Â There’s your fun, informative trivia for the day. Now [cracks knuckles], time to get to work. This is a day that means a lot to me. Â Spirit Day, Purple Shirt Day, Support LGBTQ Youth Day, however you want to call it, it’s a day that both reminds me of how my oldest child struggled with coming out, with bullying at his school, and how many kids around the world face this every day. Â It also gives me hope, because my second child–while still facing the struggles that so many youth face as LGBTQ–and her girlfriend faced a wave of acceptance. It gets better? Â It’s GETTING better, but that’s because of supportive folks like yourself and GLAAD’s drive to educate the public. 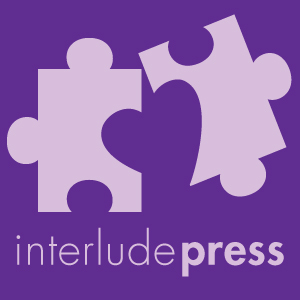 So here’s where you come in: my publisher, an LGBTQ publishing house, is not only dropping the price of all books today by 25%, they will be donating $1 to GLAAD for every book, print or electronic, sold today. And I’m matching dollar for dollar for any of my books purchased. That’s a price cutÂ and $2 to a terrific organization, their purpose to help make life better for the queer youth of today and tomorrow. Â All day, until midnight PST in the US, so grab my book, someone else’s book, get involved with IP’s direct donation link, just show your SPIRIT! You won’t get it in your hot little hands until December 3, but you’ll be sure to have a copy ON December 3, especially if you order it straight from my publisher. That’s the smart buy, and I’ll tell you why: when you buy a physical book from Interlude Press, they’ll also give you the eBook. Â FOR FREE. Â (And it’s a DRM-free eBook, which means you can put it on multiple devices!) Â Pre-sales with IP are limited to the US and Canada, BUT! If you’re from outside North America, save your receipt from your purchase and IP–up until February–will give you a free eBook. Pretty rad. Â Two books for the price of one. Of course you can order early from Amazon, but… They kind of don’t tally up pre-orders as one thing, so it ruins your Release Day numbers (which are really, really important). BUT YOU CAN. You canÂ also tell your library about my book (give them the ISBN:Â 978-1-941530-55-9) and then that won’t cost you a penny, your library will have a shiny copy for you to read, and your librarian will thank you for adding a little more diversity to their shelves! 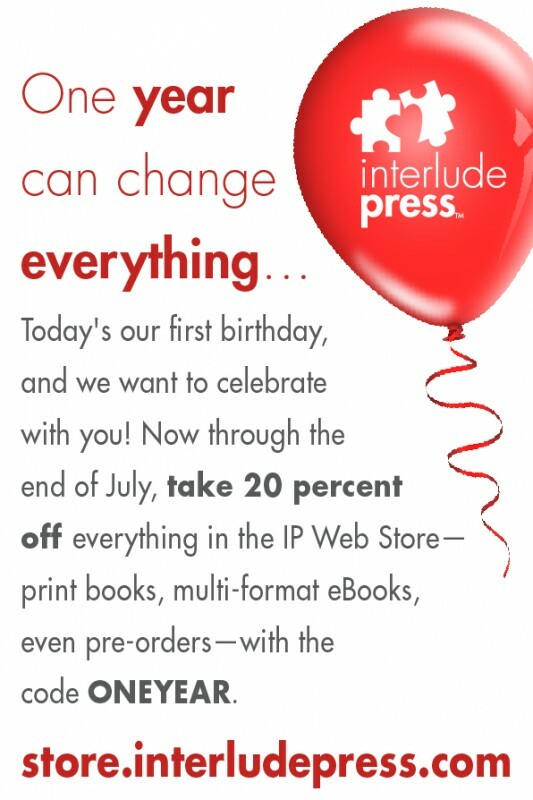 My publisher, Interlude Press, is officially a yearÂ old today, and to celebrate, they’re offering 20% off of ALL BOOKS, past published, eBooks, and pre-sales, through the month of July! 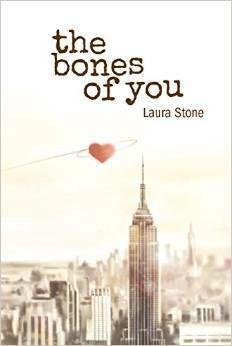 Just for examples, the eBook of The Bones Of You is currently 7.99, USD, but with the discount, that… carry the one… radican of X, A LOT LESS. Like, 5 bucks. Â A cup of over-priced coffee, is what i’m saying. PRACTICALLY BOOK THEFT, except not because of that whole fiveÂ dollars thing. Â There are some terrific books in the store, so check them out, load up, and be sure to use code ONEYEAR to get your discount.